iMose Mobile is once again on the tech market, this time for the release of the iMose X-1 Pro tablet which is a follow-up to the previously released iMose X-1. The 7-inch tablet runs on Android 5.1 OS which is in direct contrast with the X-1 tablet which runs on Android 4.4(KitKat). The attractive design is built social media-ready so it is easier to connect to friends and loved ones with Skype, Facebook, Twitter and Whatsapp. The device carries many other exciting features of which its catchy colours are inclusive. The device comes in black, gold and pink colours. 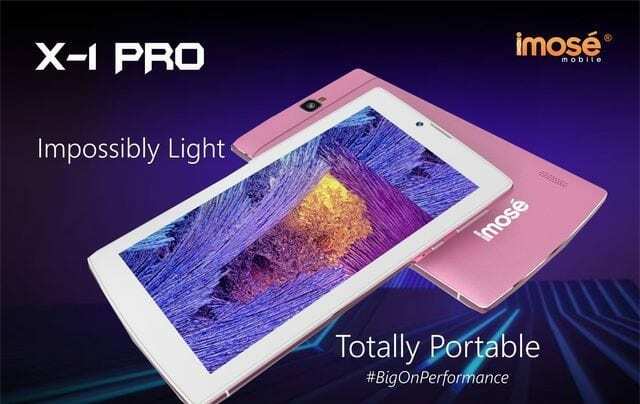 The iMose X-1 Pro Tablet features a 7-inch touchscreen which is nothing short of impressive makes for high definition viewing both indoors and even outdoors. The device also comes with a free attached leather cover case while sporting its catchy pink, gold and gold colours. Both camera modules are built for an enjoyable camera experience. The rear camera is an 8MP shooter which is supported by LED flash while its front camera is 2MP and it is likewise good to go when the need for selfie arises. How Do I Forward Phone Calls On AT&T? How To Delete All Of Your Instagram Pictures? How To Cancel Paypal Credit? How To Avoid Game Of Thrones Spoilers? How Can I Subscribe To Amazon Prime Video? How To Know If Someone Blocked You On Viber? The device which is powered by a 1.2GHz Quad Core processor comes with an inbuilt storage of 8GB and it goes hand-in-hand with a 1GB RAM giving you just enough for your files, pictures, videos and more. The iMose X-1 Pro device runs Android 5.1 ensuring you enjoy high performance across all spheres. The X-1 Pro comes in catchy colours like black, gold and pink. It is available on online stores for as low as N29,500.